IELTS/PTE/ TOEFL Preparation is not just about doing practice, it’s very much a technique oriented ART just like learning English or for that matter any other languages . However it is true that every artistic aspect can be broken down to its sub tenets and be made to look like a scientific exploration. At ‘Ambrish Tiwari’s - IELTS Academy’ we help aspirants with this technique oriented and strategy driven training after we have analyzed the profile of the candidate initially. A personal profile analysis helps the trainer to understand the special needs of a candidate so that he or she can be helped to overcome the shortcomings and hone the skills. One to one attention in the classroom is thus made possible as the trainer is fully aware of the abilities of each candidate. 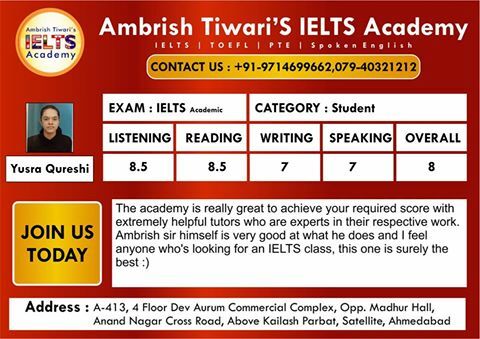 In addition several years of experience in the field makes ‘Ambrish Tiwari's IELTS Academy’ an instinctive judge of respective student capabilities and has helped them to build a team of skilled, experienced, compassionate and dedicated trainers that works towards the success of each of the students studying at ‘Ambrish Tiwari's - IELTS & Spoken English Coaching Classes in Ahmedabad’. Mock tests are conducted from time to time to monitor the progress of students and instill confidence in them. The library is well stocked with reference material and take-home study material is handed out as well. Upon completion of a module students are offered the opportunity of unlimited practice at the institute. Practice test for Reading, Writing, Listening and Speaking. Audio/Video classes for speaking section that include accent neutralization. Special batch for weaker students for sure shot high score.